Our innovative one-piece design uses the most advanced manufacturing methods available to carve out a single, monolithic blade/handle body from a solid slab of hardened aluminum. This means you won't see the alignment errors that can happen when a separate blade is manually assembled to a separate handle, as in the more common two-piece design. The hefty construction of the 1/4" solid alloy body and the 3/4" thick integrated alloy handle feels right in the palm of your hand. 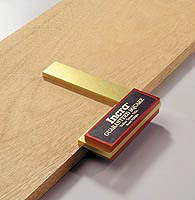 Unlike conventional two-piece squares, the Incra Guaranteed Square won't get "bent out of shape" if you drop it. 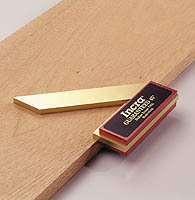 The trademark gold and red hardened anodized surface is not only durable, but beautiful, and it won't tarnish like brass. Combine this with modern functional styling, and you've got a tool that is worthy of the most prominent location in your display cabinet. Angular accuracy is guaranteed to be less than 0.001" maximum deviation from normal at any point along the full length of the blade.